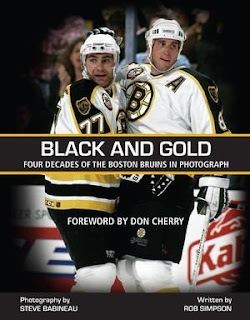 Black and Gold: Four Decades of the Boston Bruins in Photographs is a stunning collection of photographs of Steve Babineau, the Boston Bruins official team photographer since 1973. "Babs," as he affectionately is known, has seen a lot of hockey history through his lens in that time. Now, with writer Rob Simpson, Babineau shares his memories of one of hockey's most storied teams. He has seen so many of the Bruins greats and greatest moments: Johnny Bucyk, Bobby Orr, Phil Esposito, Gerry Cheevers and cover boys Ray Bourque and Cam Neely. And don't forget about the Bruins beloved tough guys and grinder: Terry O'Reilly, Stan Jonathan, Jay Miller, Al Secord and Wayne Cashman. There are over 300 colour and black-and-white photographs featured in the book. Many of the photos have never been published before. There are some great action shots and unique vantage points, but, from an outsiders viewpoint, there are not a whole lot of must see images. Bobby Orr in action in a Boston Braves (AHL) jersey tops the list. Terry O'Reilly clocking Steve Jensen, rookie Ray Bourque in a #29 jersey, Phil Esposito trying to score on brother Tony and a few behind-the-scenes shots of Don Cherry really stand out. The book, published by Wiley, is well done. It is far from your normal picture/coffee table book. While Babineau's photography is the star of the show, it is the writing that really completes this book and makes it special. Veteran journalist and broadcaster Rob Simpson provides perspective for so many of Babineau's shots. He features profiles and interviews with many former Bruins players, coaches and managers, offering first hand stories and anecdotes. The great tradition of the Bruins franchise is very evident in the text as well as the photos. Simpson also writes from Babineau's perspective, which is often the best writing in the book. He looks at life growing up a Bruins fan, his own hockey playing days, his love of photography and working with the Bruins. I especially enjoyed Babineau's stories of his high school hockey career. The back of the book lists all the players that wore the spoked-B in Babineau's time. Divided into categories of coaches, masked men, blueliners, scorers, enforcers and grinders, the compendium offers player names, years, stats and jersey numbers, as well as the briefest of comments. It's a neat little encyclopedic entry making this coffee table book even that much more special. This book will be a must have this Christmas for all Bruins fans. They will learn some of the best shots in team history were not taken by names like Esposito or Neely, but by team photographer Steve "Babs" Babineau.